The 56th edition of the Vuelta Ciclista al País Vasco, or Tour of the Basque Country, will as always be a race for the real climbers. From Monday 4 April 2016 till Saturday 9 April 2016, the peloton rides through the tough Basque landscape. Five stages, an individual time trial and an average of six climbs per stage, that’s the programme of this WorldTour race. Among others Tony Gallopin, Louis Vervaeke and Tim Wellens will participate for Lotto Soudal. Sports director Mario Aerts and Tim Wellens already look forward to this race. Mario Aerts said: “The course is even tougher than previous editions. In my opinion, this is the hardest one week race of the season. Right from day one , the riders need to climb a lot. It will be a short stage so the pace will be very high. Whether someone has good legs or not will already be clear after this stage. Also the second stage will be important regarding to the GC. On the third day there might be a chance for escapees to win the stage, but it’s also the only opportunity for the sprinters in this year’s Tour of the Basque Country. But it will depend on how the sprinters will cope with the many climbs. The final three stages will determine the position on GC. Stage four and five contain a few steep climbs, also during the closing time trial there’s a tough climb on the route. “Louis Vervaeke is a rider who is able to handle such steep climbs. He’ll get a free role in the first two stages and he may try to obtain a good position on GC. Louis was already in good shape during the Volta a Catalunya and hopefully he can maintain that form. "Tony Gallopin, Tim Wellens and Jelle Vanendert participate in this race with the Ardennes Classics in mind. I think this race is a perfect preparation to test the condition with regard to the second part of the Belgian cycling season. "Thomas De Gendt, Maxime Monfort and Sander Armée are three riders who can join a break. In stage three we can go for a sprint with Tosh Van der Sande. Thomas and Sander already showed that their shape is good, it will depend on how Maxime has recovered from the sad news he received on Monday. Antoine Demoitié was a very good friend of him so mentally he’s going through a hard period. We arrive in Spain on Saturday and we’ll do a training ride on Sunday. In the afternoon we’ll watch the Ronde Van Vlaanderen." 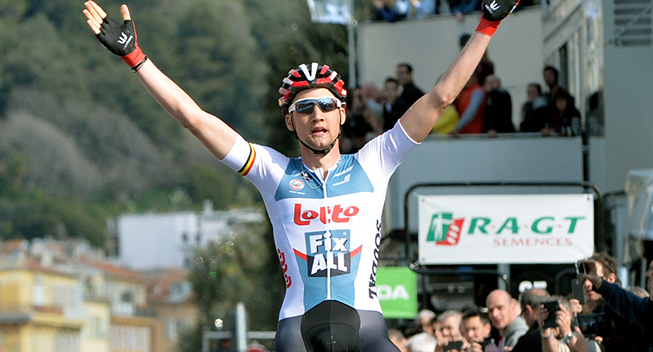 Tim Wellens said: “After Paris-Nice I was a bit ill, therefore I was unable to start in Milano-Sanremo. That was unfortunate but I quickly moved forward. From the moment I was able to get back on the bike, I went to Malaga to train. I did very long and tough endurance trainings in the mountains. The weather conditions were perfect so I could prepare myself entirely for the coming races. “My participation in the Tour of the Basque Country only has one purpose; preparing myself for the Ardennes Classics. In my opinion, this race is the perfect preparation because there are a lot of steep climbs on the route. "I won’t aim for a good position on GC. If I manage to win a stage, that would be very nice of course. But we’ll see, if I feel good then I’ll definitely try something. Nevertheless it will be difficult to obtain a stage win because all the riders will be in a great shape. I was able to win the final stage in this year’s Paris-Nice against some strong riders, perhaps I’ll have another chance next week. Sander Armée, Thomas De Gendt, Tony Gallopin, Maxime Monfort, Tosh Van der Sande, Jelle Vanendert, Louis Vervaeke and Tim Wellens.